During the first 18 months of the Donald Trump presidency, an increased number of Hispanics see a worsening situation for themselves and Hispanics overall, as well as an erosion of their optimism about the future financial well-being of their children. This is particularly true for foreign-born Latinos, especially those who are not U.S. citizens. Latino views of their place in America and their personal finances have also declined in recent years. At the same time, however, a large majority of Hispanics say they are proud to be both Hispanic and American, and they continue to see the U.S. as a land with better opportunities than their country of origin. Among Hispanics born in other countries or Puerto Rico, a large majority would make the move to the mainland U.S. all over again, given the opportunity to do so. Latinos are split about their place in America a year and a half into the Trump administration. About half (49%) say they have serious concerns about their place in America now that Donald Trump is president, while 46% say they are confident about their place in America. The share of those concerned is up and the share who express confidence is down in 2018, compared with a survey taken in January 2017, before Trump took office. At that time, 41% of Latinos said they were concerned about their place in America while 54% said they were confident about it. This growth in worry about their place in America is driven by a rise in concern among immigrants, those with no college education and independent voters who do not identify with or lean toward either the Republican or the Democratic parties. In 2018, Latinos most concerned about their place in America are foreign born. Among immigrant Latinos, 57% say they are concerned, compared with 42% of those born in the U.S. Of the foreign born, those who are not U.S. citizens and do not hold a green card have the most concern, compared with Latino immigrants who are U.S. citizens and those who are lawful permanent residents. There are also some differences by party affiliation and gender. Hispanic adults who identify with or lean toward the Democratic Party (57%) are significantly more likely to say they are concerned about their place in America than those who identify with or lean toward the Republican Party (26%). In addition, Hispanic women are more likely to express such concern (55%) than Hispanic men (43%). In the past five years, the share of Hispanics who see the state of U.S. Hispanics worsening has grown dramatically and now rivals the negative views expressed in 2008, during the Great Recession. Nearly half (47%) of Hispanics say the situation of U.S. Hispanics is worse than it was a year earlier, up sharply from 15% in 2013. This change in views is more dramatic among some groups of Hispanics: Democrats, women and those with at least a high school education. In 2018, a majority (57%) of Hispanic Democrats say the situation of Hispanics in the U.S. has worsened in the past year, up from 12% who said the same in 2013. By contrast, the share of Hispanic Republicans who say Hispanics’ situation has worsened is 28%, up moderately from 18% in 2013. The views among Hispanic women about the situation of Hispanics in the U.S. have also grown sour in the past five years, more so than among Hispanic men, though such sentiment is up in both groups. When it comes to living in the U.S., a majority (54%) says it has become more difficult to live in the country as a Latino in recent years, while 42% say things haven’t changed much. Among the most likely to say that it has become more difficult for Latinos are those who are foreign born, those who are Spanish-dominant speakers and those who are not citizens. About two-thirds of each group says so. For their part, Latino Democrats (61%) are twice as likely as Latino Republicans (30%) to say it has become more difficult to be Latino in the U.S. in recent years. The U.S. economy has improved in recent years, Latinos’ household income is at a record high, unemployment among U.S. Latinos is at a record low and poverty levels among Latinos have dropped. Even so, Latino adults are more downbeat about their current financial situation today than they were three years ago, according to the new survey. In 2015, 40% of Latinos said their personal financial situation was in “excellent” or “good” shape; today only 33% say the same. By contrast, assessments of personal finances are up among the general U.S. public. The decrease in the share of Hispanics rating their personal finances as excellent or good in the past three years is greater among certain subgroups. Hispanic men and women had similar ratings of their finances in 2015, but in 2018, women rated their situation lower. For their part, Hispanic young adults ages 18 to 29 used to rate their finances in a more positive light than older Hispanics three years ago (48% vs. 37%, respectively), but now their assessments resemble those of Hispanics ages 30 to 64 (33% vs. 32% respectively). From 2015 to 2018, positive financial ratings also fell among Hispanic Democrats but were stable for Hispanic Republicans. But perhaps a more remarkable change is the grim forecast Latino adults paint when looking into their financial future. Today, about six-in-ten (62%) say they expect their personal financial situation to improve in the coming year, down 19 percentage points from three years ago (81%) and at the lowest level recorded since the Center first asked this question in 2004. Even during the Great Recession, when finances of Latinos were doing poorly, about two-thirds of Latinos expected their personal finances would improve the following year. This turn in attitudes is more notable as Hispanics’ views of their personal finances in the future have consistently been more positive than assessments among the general public. However, in 2018, members of the U.S. general public were more likely than Hispanics (68% vs. 62%) to say they expect their finances to improve in the coming year. The drop in financial optimism observed in the past three years is larger among some subgroups of Latinos. They include immigrants and their U.S.-born children, those with lower levels of education and Democrats. 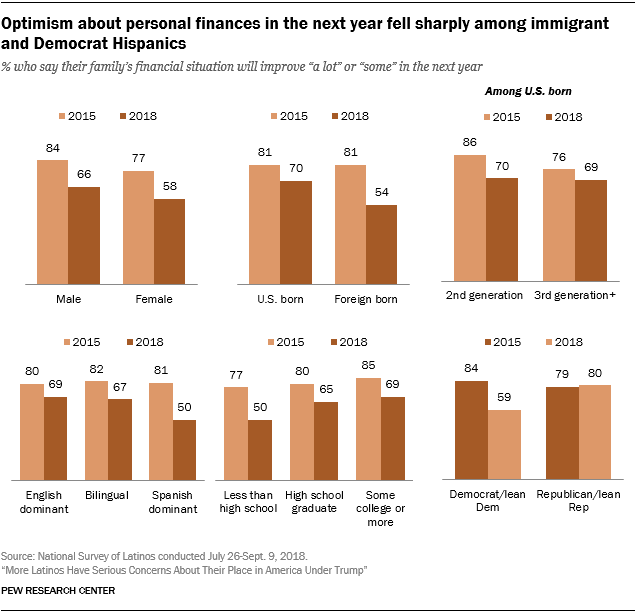 By contrast, financial optimism remained mostly unchanged among Republican Latinos. The downcast view of their own financial future extends to that of their children. Today only 54% of Latinos say they expect their children will be better off financially than themselves, a sharp reduction from 72% who said the same in 2015. 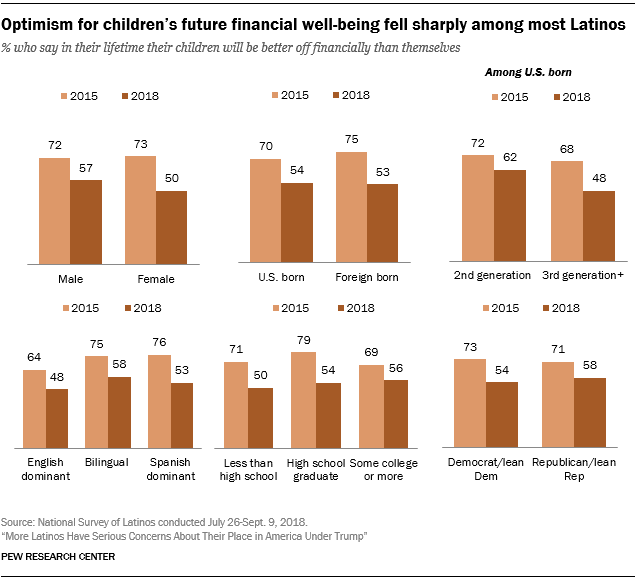 The reduction in optimism for the financial well-being of their children is larger among some Hispanics, especially those without college education, immigrants, those third generation or higher, naturalized U.S. citizens and women. Financial optimism for their children declined more dramatically among immigrant Hispanics than their U.S.-born counterparts. For their part, U.S.-born Hispanics with U.S.-born parents had similar financial optimism as U.S.-born Hispanics with immigrant parents three years ago but now are markedly less optimistic. U.S.-born Hispanics with immigrant parents are also more optimistic today about their children’s financial future than are Hispanic immigrants. Among foreign-born Hispanics, those who have become U.S. citizens had a sharper dive in optimism about their children’s future (from 77% to 50%) than did non-citizens (from 74% to 55%). Among Hispanic women, optimism for intergenerational progress fell more dramatically between 2015 and 2018 than among Hispanic men, creating a gender gap on this question. Despite their pessimistic view of their current situation in the country and their diminished optimism about their children’s future, large majorities of Hispanics in the U.S. express pride in their ethnic and national identities, and still see the U.S. as a place with better opportunities than their countries of origin. Fully 97% agree with the statement, “I am proud to be Hispanic.” And 84% say they completely or mostly agree with the statement, “I am proud to be an American.” The survey also finds that 82% agree with both statements, saying they are proud to be Hispanic and proud to be American. Their pride in being American varies across some demographic groups, even though large majorities express this. Ties to the U.S. matter when it comes to expressing pride in being American: U.S.-born Hispanics are more likely than the foreign born to say they are proud of being American (91% vs. 77%). Among immigrant Latinos, those who are U.S. citizens (93%) are just as likely as the U.S. born to say they are proud of their adopted nationality, while those who have a green card (72%) are more likely to express pride in being American than those who are neither citizens nor permanent residents (61%). Although most Latinos say that life in the U.S. has become harder for Latinos, seven-in-ten immigrant Latinos or those who moved to the U.S. from Puerto Rico say that, given the opportunity, they would come to the U.S. again, while 17% say they would stay in their home country or Puerto Rico, and 11% say they would move to a different country. Compared with 2011, when the question was last asked, the share who say they would come to the U.S. again is down, while the share saying they would move to a different country is up. When asked to assess how the U.S. compares with their country of origin, 85% of Hispanics say the opportunity to get ahead is better in the U.S., with similar shares among those who immigrated to the U.S. and those who were born here. Similarly, about three-in-four (74%) Hispanics say the conditions for raising children are better in the U.S. than they are in their country of origin. In both instances, opinions are unchanged since 2011 when the question was last asked. Puerto Ricans have less positive views of the U.S. than do Hispanics from other origins. Those who moved to the U.S. from Puerto Rico are less likely than Hispanics who migrated from another country to say they would move again if given the opportunity (54% vs. 71%). Three-in-four Puerto Ricans (74%) say the opportunity to get ahead is better in the U.S. than in the U.S. territory, compared with 86% of Hispanics who are not Puerto Rican. Similarly, 54% of Puerto Ricans believe the U.S. has better conditions for raising children, compared with 76% of Hispanics of other origins.